Dermatology consultation with a man. Photo courtesy of Shutterstock. The importance of skin specialists has increased considerably in view of greater incidences of skin ailments and infections. Higher levels of pollution coupled with unhealthy food habits has resulted in more number of dermatological cases particularly among teenagers and young adults. 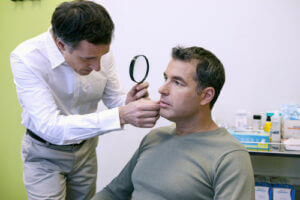 Doctors treating skin diseases also treat nail and hair fall. Dermatological cases are more rampant in tropical regions because of unfavourable climatic conditions of heat and humidity.